Donald Trapani has lung cancer and is in the care of Hospice of the Valley, the largest hospice organization in the Phoenix area, but he doesn't let that stop him from entertaining others. 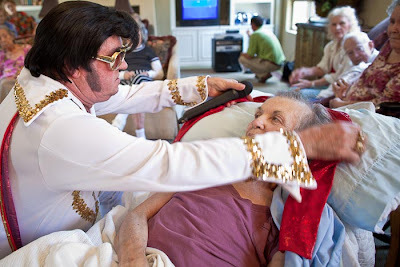 Each week he dons a white jump suit like the one Elvis Presley used to wear and visits nursing homes and hospice units to entertain the patients. Monday he put on a 45 minute show in the Alzheimer’s unit at The Stratford, an adult living facility in central Phoenix. There are more photos in my archive and available from ZUMA Press.